Yesterday I had breakast at Primo's before an afternoon spent supping some decent ales from Ilkley Brewery. 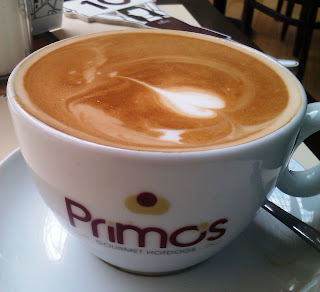 Primo's is a grand place to while away some time with a coffee, situated as it is in the corn exchange under the spectacular domed ceiling. The menu theme is very much an American one, the focus on shakes and dogs with a few salads and breakfasty things listed too. I chose the American pancake stack with maple syrup and bacon (about £3) and a flat white coffee (£2.30). The coffee didn't look great (here's a pic of a better looking Flat White by way of comparison), but tasted excellent. The pancakes were good too, thick and fluffy in the American style and drenched in maple syrup. Sandwiched inbetween were strips of salty bacon, which tasted fine but let the side down a bit by being limp rather than crispy. I've only lately been persuaded of the joys of the sweet and savoury combination at breakfast time, but it really does work. There is just something so addictive about the calorific salt/sugar hit, it never fails to please. I must offer an apology to a certain friend of mine, who was ribbed mercilessly as we travelled through about 23 states of the Union over the course of 5 weeks some years ago, mainly because of his unseemly American habit of pouring maple syrup on anything porky in the mornings. Sorry, you were right all along. 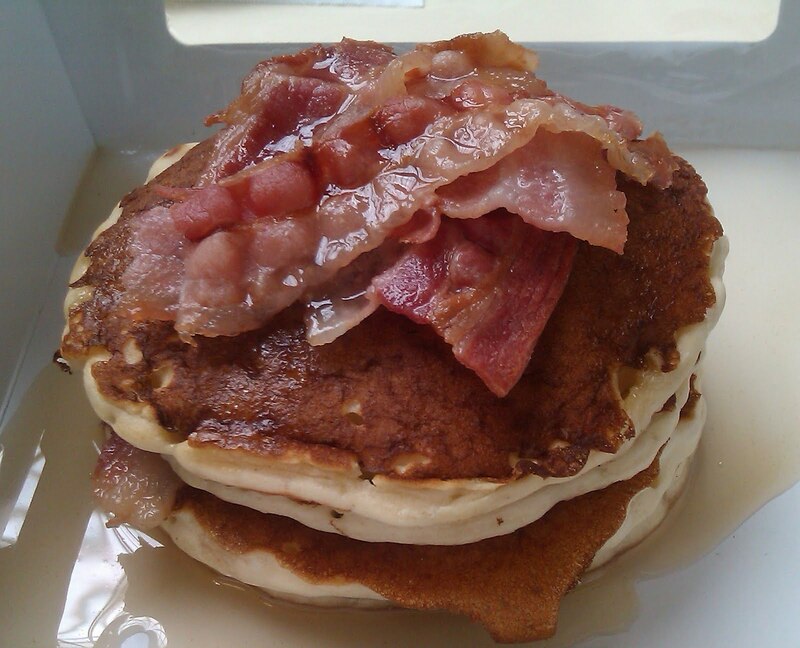 Bacon + syrup = winning formula. It seemed a bit unfair to judge Primo's solely on their breakfast offering, particularly when the place is named after hot dogs, so today I went back to sample one of those. My first two choices were both off because they had run out of chilli, so in need of spice to clear a fuzzy head I ordered the Mexicana (£3.95), an all beef frankfurter, topped with Monterey Jack cheese, guacamole, sour cream, tomato salsa and jalapeños. It was ok, but nothing more really. The best part was the bread, a good quality, slightly chewy seeded bun. 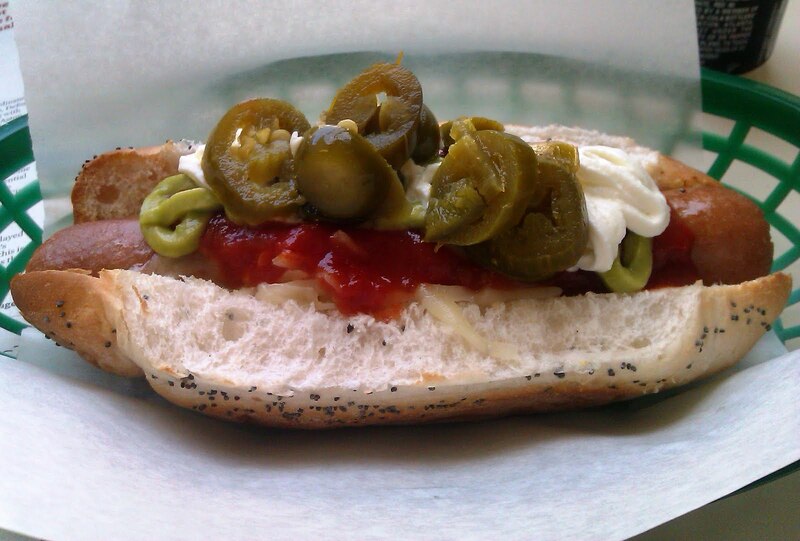 The sausage and toppings were pleasant enough but unremarkable, no particular flavour really stood out other than vinegar and chilli from the pickled jalapeños. The above all sounds a bit critical, but I still quite like it here. I'd certainly pay another visit for a coffee, and would give another dog a go. The shakes look good too. Cheers for commenting guys. Lot of love out there for Primo's so I'll defo give it another shot at some point.